Aspen Is A Rock Star! Just wanted to drop you a note on our 10 year Anniversary with our beloved Aspen (that’s him in front of me on the left) I will never forget the day you found us worthy of such a wonderful dog. Our boy is slowing down a bit but is still a happy go lucky big lug (As long as you stay away from his food…LOL) I can’t believe he has been ours for 10 years. 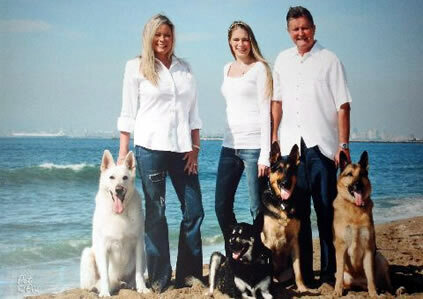 As you can see, thanks to GSROC we have added to the family over the years and while each furbaby came with their own issues, with love and patience they were worked out. We cannot thank you enough for all you do and the dedication you have to finding these wonderful animals loving homes. Thank you again for our beloved furbabies.